Bruce and his band played to an adoring crowd at the Jordan Centre on the Penn State University campus in State College. He thanked New Jersey Governor Chris Christie for "doing a fine job" of taking care of citizens. He also lauded police, firefighters and other first responders. He then launched into an extended, heart-wrenching rendition of his song City In Ruins. 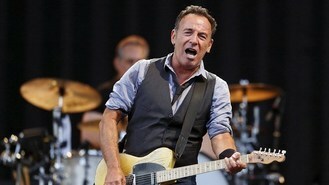 Bruce and the E Street Band performed in the upstate New York town of Rochester, a concert that had been postponed from Tuesday because of travel difficulties caused by the storm. The rocker will join NBC's planned benefit concert on Friday for victims of the storm.